Making the best holster on the market means doing a lot of little things other companies don't. To ensure top quality finished goods, we start with top quality components. Whether it's our belt buckles or our Kydex pockets, our belt clips or our leather backers, we guarantee our products are greater than the sum of their parts - and that's saying a lot! To start, we'd like to share more about the premium leather used in each and every holster we handcraft. Whether you're considering our classic SuperTuck IWB Holster or the new Reckoning Holster in OWB, you'll have three quality types of leather to choose from when building out your custom CrossBreed Holster; black cowhide, horsehide, and our Founder's Series Leather. Which one is right for you? Let's take a look at what each one has to offer! Our Black Hand Dyed Cowhide leather is tanned exclusively for CrossBreed Holsters. The hides are cut to the desired shape that best supports each pistol’s needs. The cutouts are then hand dyed, beveled to ensure maximum comfort, and sealed with leather conditioner to ensure it will last a lifetime. The Black Cowhide is superior quality is the key to offering great stability combined with extreme comfort. Our horsehide is made from the extremely sought after Shell Cordovan sourced from Horween Leather, the only horse hide tannery in the United States. Horsehide is a very dense, tight grain leather that allows for a much thinner holster with the same increased stiffness and retention. Though horsehide is moisture resistant and not waterproof, this leather will hold up better to high moisture environments better than cowhide because of its density. We recommend horsehide to people living in very hot humid climates or those who perspire heavily. Horsehide does take a bit longer to break in than the cowhide options due to its tighter grain, but once that break-in period is over the horse will conform to the shape of your body and stay in that shape. We created our Founder's Series to not only honor the legacy of CrossBreed's founder Mark Craighead but to also give you the most comfortable carry of any leather-backed holster we offer. Founder's is 100% vegetable-tanned leather using no dyes or lacquers. The hides then have natural oils and tallows applied under pressure, giving each hide and each piece a unique and distinctive appearance. The natural oils accent the grain and structure of each piece, resulting in a beautiful piece of leather that will withstand moisture, sweat, and environmental conditions. To honor Mark Craighead's legacy, the CrossBreed Founder's Series leather is stamped with his signature and logo along with a simple cross to symbolize his faith and devotion. Although all of our leather hybrid holsters are treated with leather conditioner before they leave the shop, it may be necessary to condition the leather over the life of the holster. The conditioner should contain gentle ingredients and needs to be applied only to the gun side of the leather with a minimalist approach. The back side of the leather will be conditioned with the natural body oils from your skin and no further treatment is needed. If you need to clean the leather of your holster, saddle soap is recommended, followed by leather conditioner after the holster has fully dried. 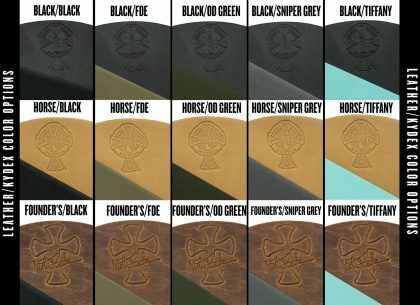 In addition to the various leather options described above, we also have several Kydex colors to choose from as well; Black, Flat Dark Earth (FDE), OD Green, Sniper Grey, and Tiffany Blue. 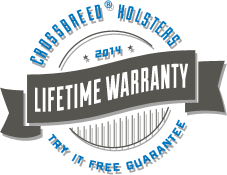 Whichever combination of leather and Kydex you choose, all of our holsters come with an unbeatable Lifetime Guarantee. 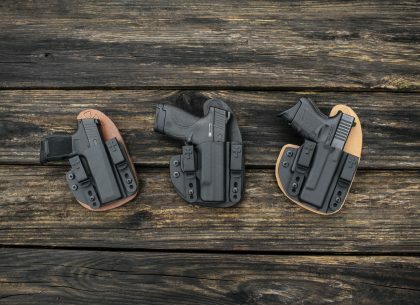 After your two-week-try-it-free period is over, you can rest assured knowing that we will repair or replace your holster as long as you own it if it fails you in any way under normal use. Now that you know all about your leather options, head over to our website to build your own handcrafted holster today! 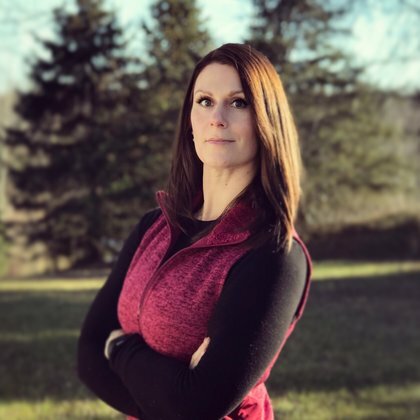 Jenn was born and raised in a big family in rural Northern Wisconsin — learning about firearm safety, hunting, and fishing from an early age. She is the daughter of a great hunter, a wife, a mother, a Visiting Fellow with the Independent Women’s Forum, a former editor for Bearing Arms, and a “good gal with a gun.” She frequently appears on NRA TV, has been covered by Townhall.com, the Washington Post, and Women’s Outdoor News. She has hundreds of hours of firearms training under her belt including street encounters, low light/no light training, and is a graduate of the Gunsite Academy. Jacques is an active and ardent supporter of the Second Amendment, an outspoken concealed carry advocate, and an avid outdoorswoman. She can be found on Twitter, Facebook, and Instagram.